And how will it revolutionise your living room? It's been absolutely ages since Apple announced a new system called HomeKit, it enables users to control connected smart home accessories and appliances from your iOS device. Sounds pretty exciting, right? But there's STILL a bit of confusion surrounding the new service, and we'd like to clear that up. We like to compare HomeKit to AirPlay, the music and video wireless protocol which provides a simple and seamless streaming solution to all compliant devices. Apple briefly outlined how HomeKit will work during their Worldwide Developers Conference in June (but blink and you'll miss it). We've collected all HomeKit information in one place. 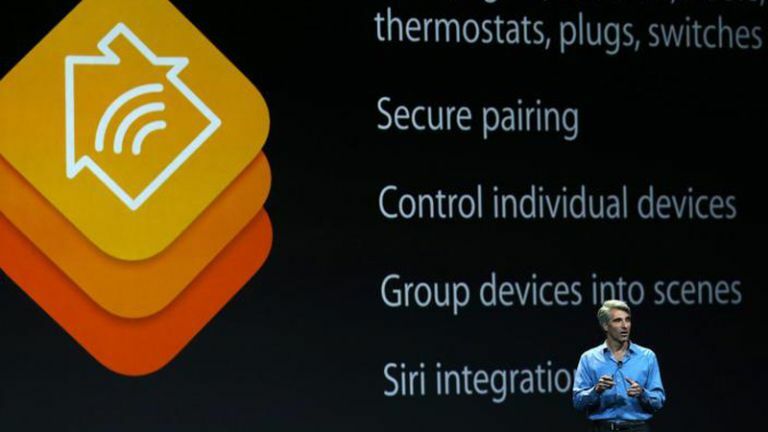 Apple HomeKit was baked into iOS 8, but we never saw it appear during its lifetime. Instead, the new service will go live with iOS 9, the company's upcoming OS due for release this autumn. When setting up HomeKit you'll need to give everything a name, this will allow Siri to understand what you want to control with a given command. For example, you'll be able to ask Siri to turn the Desk Lamp off. Although, we'd like to think T3 readers are a bit more creative, maybe call the lamp Steve? And the slow-cooker Larry? You'll also be able to group devices, making it easier to control multiple things at once. This would allow you to turn everything off in your living room, second floor, or even everything in your entire house with a single spoken command. That's pretty futuristic, right? Every room in your house must have a different name, and HomeKit even has a function for multiple home owners. Action Sets and Scenes are pre-programmed tasks that can be activated using Siri. For example, you can tell Siri it's bedtime, and it will set the alarm clock, switch on the door and window sensors, and turn off all of the lights. Other useful applications we can think of are, 'I'm going to work' and 'I'm going on holiday'. One of the major HomeKit components will be the Apple TV, with the media streaming device acting as a central hub for your smart home. You won't necessarily need an Apple TV to use HomeKit, but it will serve as an intermediary if you're away from home and need to turn your heating on, for example. Essentially it's an entry point to your local network when you could be ANYWHERE in the world. Your HomeKit devices and Apple TV will need to be registered with the same Apple ID for this functionality to work. The most popular smart home devices so far have been connected light bulbs, they're everywhere. Apple HomeKit will go beyond that and include window and door sensors, thermostats, switches, and eventually white goods such as washing machines and fridges. Which companies have signed up so far? A number of companies have announced HomeKit products already, these include Ecobee (US only) with an intelligent thermostat, Lutron with some smart lighting, iHome, Honeywell, Philips Hue, Withings and Insteon. Our favourite manufacturer so far has been Elgato, who are producing some really sleek sensors to keep your home safe and secure. HomeKit will feature a number of privacy and security layers according to Apple. The system will feature end-to-end encryption between the iOS device and smart device (meaning the signal would be difficult to intercept and read). Does this mean it's completely hacker-proof? We're guessing definitely not, it's only a matter of time before someone figures out how to control HomeKit items without consent -- but hey, we could be wrong, and the chances of that happening to you are pretty slim. Apple has just announced a 'Home' app at WWDC 2016. Home allows you control all of your Apple HomeKit devices and Scenes from a single app. It's an attractive looks UI, and even includes shortcuts in Control Centre, making control quicker and easier. More speculation, this time around non-HomeKit enabled devices. If you've got a product that runs on different protocols (such as Z-Wave), you may be able to connect them to HomeKit using a hardware bridge. Apparently Apple won't allow bridged products to connect over Wi-Fi due to security concerns, but will play nice with Bluetooth LE devices. I've got an Android phone! Want all the smart home fun but have an Android phone? Don't worry, the OS war is set to continue in the living room with Google's Project Brillo - an Apple HomeKit rival for Android fans. Also, if you're specifically a Samsung user, there's a platform called Samsung Smart Home.